The root canal is the space within the tooth that holds the pulp (nerves, blood vessels and other connective tissues).In a child the pulp in the root canal system plays a role in tooth development. In an adult the pulp plays several roles such as defense function (pain sensation), reparative/ regenerative function. Sometimes the pulp can be damaged and the pulp tissues injured or infected. 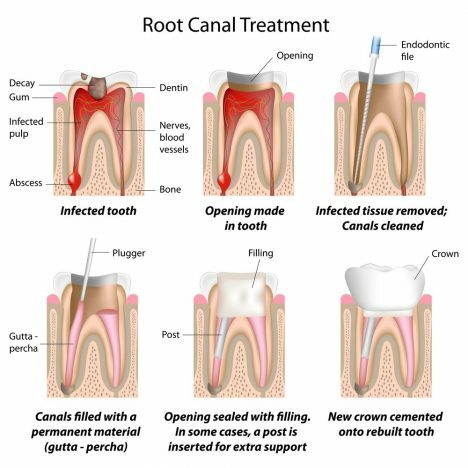 One of the treatment option for damaged or infected pulp is Root Canal Treatment (RCT), which is a sequence of treatment to remove the infected painful pulp tissues. It may take several visits to complete a RCT of an infected tooth. Local anaesthetics will be administered before RCT, which make the treatment as painless as possible. An access opening will be made through the top of the tooth into the root canal system. Special instruments will be used to remove the infected pulp tissues. The root canals will be cleaned and disinfected. Filling of the root canals will be done with a rubber-based material (gutta-percha). A final restoration will be placed over the access opening. In some cases, your dentist may indicate a post-core and crown for the tooth after the RCT, especially for fracture-prone teeth like the molars, or teeth that are extensively damaged. So, a RCT allows your dentist to “save” the tooth, which would otherwise be extracted. In some situations, the teeth may be so extensively damaged that RCT may not be possible. In these scenarios, the teeth may have to be extracted. Your dentist will be able to assess your dental condition and advise you on tooth replacement options.